The first wide-ranging public poll in Maine since the 2018 election has plenty of good news for Democrats after they swept the Blaine House and the Legislature, but U.S. Sen. Susan Collins is an early favorite for re-election in 2020. That looks largely to be because the opponent tested alongside her in the regular spring poll from Pan Atlantic Research of Portland — House Speaker Sara Gideon — isn’t well-known statewide. Maine’s U.S. senators and the two Democrats elected to high office in 2018 — Gov. Janet Mills and U.S. Rep. Jared Golden — all enjoy relatively wide popularity statewide. Collins led Gideon by 22 points in the poll, but there are signs that the potential Democratic opponent could rise with further recognition. The case of Collins is a curious one. 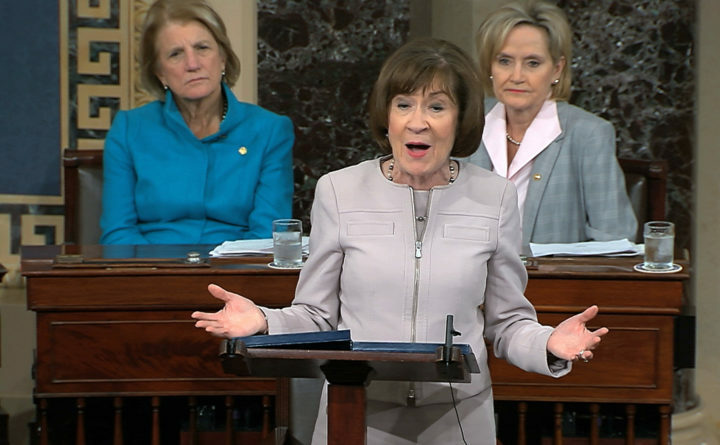 She has 62 percent approval in the poll — trailing only independent U.S. Sen. Angus King at 66 percent — and the Republican senator outpolled Gideon handily with 51.2 percent to the Democrat’s 29.1 percent among the online poll’s sample of 500 likely voters. At the same time, Gideon isn’t doing badly for someone who has never run for state office. She was seen favorably by 33 percent of those surveyed and unfavorably by 26 percent, with another 41 percent not knowing enough about her to make a decision. That latter number would shrink if a campaign launches. Collins’ mark in this poll is higher than we have seen in approval polls in the past year. After her high-profile vote for U.S. Supreme Court Justice Brett Kavanaugh, Morning Consult pegged her at 53 percent with a massive increase in support from conservatives and a corresponding decrease from Democrats who have helped her win massive margins in the past. The senator is likely to run for a fifth term. She hasn’t committed to it yet, but the race is a national priority for both parties in 2020, and she had the biggest fundraising quarter of her career at last year’s end. Gideon is one of the best-known Democrats to consider a challenge, but U.S. Rep. Chellie Pingree of the 1st District hasn’t ruled it out. A good sign for Democrats is that President Donald Trump is underwater in Maine, though not much more than he was in the 2016 election. He mustered only a 37 percent approval rating in the poll, though he is only 3 percentage points in the negative in the more conservative 2nd Congressional District. In all, 53 percent of Mainers said they wouldn’t back him next year. The new Democratic governor and congressman took office with majorities of Mainers seeing them favorably. The poll is our first look at Mills and Golden’s approval figures since the election and the news is good for them. Mills is seen favorably by 55 percent of Mainers and unfavorably by 40 percent while Golden is at 53 percent and 32 percent statewide, respectively. Pan Atlantic said Mills was seen favorably overall by people in all income brackets. Her Republican predecessor, Paul LePage, never had an approval mark as high as Mills’ first one, topping out at 47 percent in fall 2011 in regular polling from Critical Insights. Golden’s net favorability of 21 percent statewide belies a 12 percent gap in the 2nd District, which means that the 36-year-old freshman looks like he could be a strong statewide candidate in waiting with 15 percent of Mainers still not knowing enough about him to decide. Strikingly, Pingree has the opposite problem. Her in-district net favorability is 21 percent, but it’s only a 9 percent gap for her statewide. Her seat is safe, but a statewide candidacy is risky, even if she could more or less clear a Democratic field. The reconvening of both chambers and the shuffling of bills through legislative committees means it’s a typical Tuesday in Augusta. The House and Senate will meet this morning to, among other things, refer bills to committee, followed by the meeting of legislative committees this afternoon. — Proposals that could draw the most attention today include three bills to improve testing and screening for lead in buildings and in children. The Health and Human Services Committee will hear testimony on LD 1116, LD 976, and LD 986 beginning at 1 p.m. Listen here. — The Committee on Marine Resources will hold public hearings on bills to establish an elver fishing lottery if the regulating commission mandates an elver aquaculture quota, and to allow the depositing of oyster shells in intertidal zones, harbors and rivers to mitigate ocean acidification. Listen here. — Committees could vote to recommend bills for passage in the Legislature that would adjust the standards for opioid prescription, including requiring physicians to discuss alternative pain treatments with certain patients before prescribing opioids (listen here); allow dairy dealers and producers in Maine to donate leftover milk directly to state food banks (listen here); and give towns and cities permission to charge certain aquaculture lease holders a fee in order to cover municipal administrative costs (listen here). — The governor’s hometown rescinded its support for a major project she backs. At Monday night’s annual town meeting. Farmington residents voted resoundingly to rescind a 2017 letter of support for Central Maine Power’s proposed $1 billion transmission corridor to deliver hydro power from Quebec dams through western Maine to Massachusetts. After expressing skepticism about the project during the 2018 campaign, Mills endorsed it last month, citing what she described as significant perks for Maine in the developers’ enhanced benefits package. She explained her support for the project to Farmington voters Monday night, but it was not enough to sway them. The town becomes the latest and largest western Maine community to reverse its support for the project, which is rapidly becoming the first significant flashpoint of Mills’ governorship. — The decades-old debate over Native American mascots moved to the State House on Monday. A bill from Rep. Ben Collings, D-Portland, would unilaterally bar Maine public schools from adopting Native American names, symbols or images for use as mascots, team names or logos. Monday’s education committee hearing on the proposal drew testimony from Maine tribal members, including former Penobscot chief Barry Dana, who detailed the harm that such mascots caused for him as a young man and as a tribal leader. “Am I honored to be a mascot? No,” he said. After Skowhegan earlier this month became the final Maine school system to decide to retire its “Indian” mascot, Maine became the first state in the nation to completely eliminate school mascots depicting non-tribal versions of Native Americans. But petitioners in Skowhegan are pushing to retain the “Indian” mascot, and some of them made their case to the committee Monday, arguing against Collings’ proposal. — The utility that provides electricity to most of northern and eastern Maine is being sold. Emera Inc., which is based in Nova Scotia, said Monday that it had reached an agreement to sell its Maine subsidiary for $959 million to ENMAX Corp. of Calgary. Given Emera’s debts, the deal will have an estimated value of $1.3 billion, the two companies said. ENMAX is a utility that employs 1,800 people and generates and distributes electricity and other services to more than 900,000 customers in Alberta, Canada, according to its website. It has about $6 billion in assets. Officials from Emera and ENMAX said the sale could take nine months. It will require the approval of several regulators in both the U.S. and Canada, including the Maine Public Utilities Commission and the Federal Energy Regulatory Commission. — What does it mean to be “queer” in Maine in 2019? Belfast Mayor Samantha Paradis attributes some of her communication problems with city councilors to the fact that she “brings the first young, queer female voice to the role of mayor.” But the word “queer” means different things to different people in Maine. Use of the word continues to evolve, according to academics, advocates and other people who identify as queer. My first job — at age 7 — was as an “assistant” paper carrier. I delivered copies of the Evening Gazette to 13 customers six days a week in a town spitting distance from Worcester, Massachusetts. The kid who owned the route — a dictatorial 11-year-old who cheated at board games and only rooted for Marvel Comics villains — did not let me keep the tips. I got paid 50 cents a week for my labors — often in pennies dropped in the gravel at the end of the route. When he moved and I took over the route, I got to keep the tips from my loyal customers and from the 30 or so of his who then became my responsibility. When the weekly delivery fee jumped from 60 cents to 65 cents, it was a boon because customers would just hand over three quarters and tell me to keep the change. Usually, I made as much each week from tips as I did from the tiny commission on delivery. I should have figured out then that working for a newspaper would never be lucrative. The best tips — the ones I still remember warmly today — were non-monetary. A diabetic woman who lived alone would give me boxes of leftover candy the day after Halloween. A delightful Swedish woman would leave loaves of warm braided cardamom bread in the box where I put the paper. Others would knit me mittens. For these folks who were barely scraping by, a nickel or dime as a tip was a financial stretch, so they showed their appreciation in other ways.